The Hungarian or Magyar tribes arrived in present-day Hungary around 896 CE from the East. Their main activity—hunting on horseback—had multi-functionality. It let them feed and dress their people, as well as practice fighting on horseback. Dogs were their primary helpers. Archeologists and zoologists believe the Magyars had at least two types of dogs with them when they arrived. Supporting this theory are dog fossils excavated from 18 cemeteries and 15 dwellings: 32 full skeletons and 23 skulls are dated between the 10–14th centuries, the period between the settlement of the Magyar tribes and end of the Árpád dynasty, the family of founding rulers. The Kuvasz breed arrived with the Magyar tribes. The fossilized skeleton, left, is from the 9th century and was excavated from Fenékpuszta in 1978. The formation of the skeleton is almost the same as the modern day Kuvasz's on the right. According to researchers, dogs held mythical and sacrificial roles in the life of the early Magyars. In some cases, dogs were buried with their owners, leading archeologists to conclude that burial with dogs ensured the master’s safe travel to another realm after death. Interestingly, no other animal remains have been excavated. This indicates dogs had a special place in the lives of the early Hungarian people. In these archeological findings, dogs are depicted separately from other animals like deer or wolves. Also, the decoration on a horse harness excavated in the southern city of Gádoros depicts a dog wearing an expressive collar. This suggests special ceremonial hunting use of dogs. Dog decorated on a harness from around 10th century. Found at Gádoros in 1978. Ultimately, the Magyars formed the Kingdom of Hungary. They based this on Catholicism and punished those who practiced pagan rituals. However, some dog-related traditions continued until the 16th century, such as sacrificing dogs and drinking their blood. The ritual is synonymous with the notion of a dog’s ability to guard and guide its master’s soul after death. Other researchers believe the ritual was also performed during any great occasion such as celebrating a victory. It was believed that the spirit of the sacrificed dog traveled to the gods and instantly relayed a message about the victory. Conditions in Hungary were excellent for all sorts of game to thrive. Archeological excavations prove there were elk, moose, crane and bison in large amounts; therefore, hunting remained the primary activity among all the people—the aristocracy, the common people, and even the Catholic clergy. Hunting was used as a war-game during peace times and horseback hunting always involved a pack of hunting dogs. The different breeds of dogs had different strengths and purpose throughout these events. One of the best written historical examples describing how noblemen treated their dogs as a cherished pet dates to the 15th–16th centuries. Hungarian and Czech King Ulászló II's younger brother Zsigmond—the Polish prince—lived for a short period of time at the Hungarian center of nobility, the Buda Castle (1498–1501). Historians discovered his accounting books that were extensively published in 1914. According to these records, Prince Zsigmond spent significant money to bathe his dogs. He had separate soap and water for them and hired a dog washer. Historians also note Zsigmond took his dogs with him whenever he traveled, and that he received Vizsla, Agár, and other hunting dogs as special gifts from his subjects. 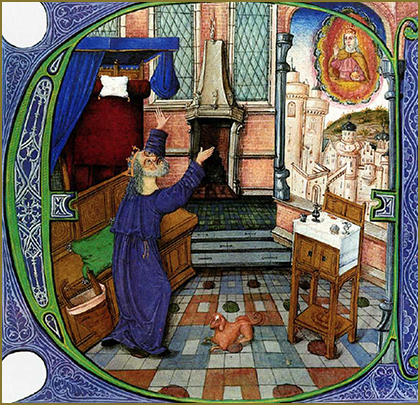 Drawing from the 14th century prayerbook, King Zsigmond’s (1387–1437) breviary found at Buda Royal Court. The illustration depicts the king’s hunting dogs and also indicates selective breeding; Agár (left), Komondor (lower middle) and Vizsla (right) are clearly recognizable. 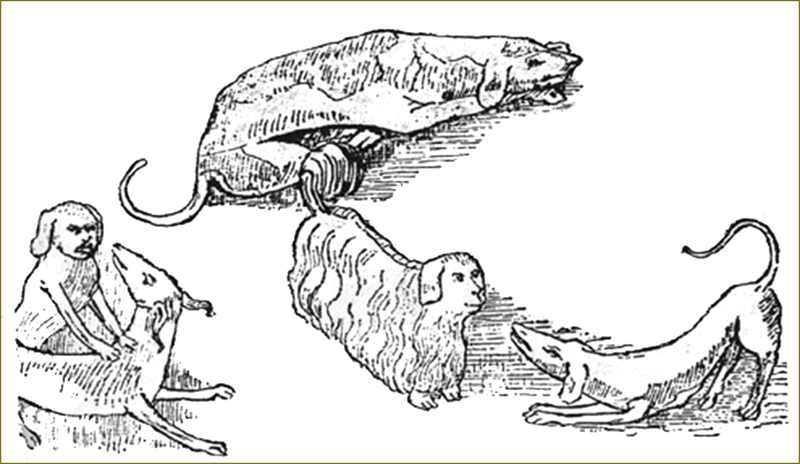 Another example of the extent of nobilities' care for their dogs comes from 1525. Hungarian King Lajos II was crazy about his dogs. He kept his favorites in his personal rooms, and they were even found at his royal dining table, a habit that shocked church dignitaries. Before he left to fight the Ottoman Empire in 1526, the King told his servants, "Make sure you care for my dogs well. Bathe them twice a week!" In 1504, the monarchy prohibited peasants from hunting moose, deer, rabbit, boar, and pheasant. This was the first step to make hunting a noble privilege. The Kingdom of Hungary was grounded on feudalism, and hunting continued to be a chief sign of status for the aristocracy. Yet at the same time, dogs were extremely important in agriculture for the common people. There are fewer ancient artifacts regarding the Komondor, Kuvasz and herding dogs, such as the Puli. Although, these dogs had crucial roles attending flocks, they were also important to Hungary’s meat exporting industry. These dogs guarded cattle during drives from the ranch to the market, which often took weeks to accomplish. Organized dog breeding in Hungary came into its own in the 19th century due to the considerable economic benefits in Europe from these dogs. Noble and middle-class families continued to breed dogs for activities like hunting while less economically advantaged people, like shepherds, bred dogs for field assistance, such as herding and protecting livestock from bears and wolves. At the same time, Hungary focused on modernizing its language, improving its economy and transportation, and gaining independence from the Hapsburg monarchy. An early advocate for Hungarian breeds, Count István Széchenyi, founded the first breed club in 1839, the Magyar Agár Society of Pest County. The Magyar Agár, a sighthound — a hound that primarily uses its stellar vision and speed while hunting — was prized by the aristocracy for long-distance horseback hunting. By 1882, a relatively new Vizsla club was holding its first Vizsla hunting competitions. The nine breeds continue to be treasured as hunting, working, and pet dogs in Hungary, as well as by a handful of canine devotees worldwide. Since little is known about them, this website highlights their legendary history in Hungary and the part they’ve played in Hungarian culture, art, and history. The oldest depiction of the nobility’s favorite dog, the Vizsla, is a pen drawing in the Codex Albensis, dating to around 1100. This antiphonarium—a collection of religious songs—was hand-decorated by one of its readers after the codex was finished. The pen drawing depicts a Vizsla staring at a rabbit that is calmly eating under a tree. 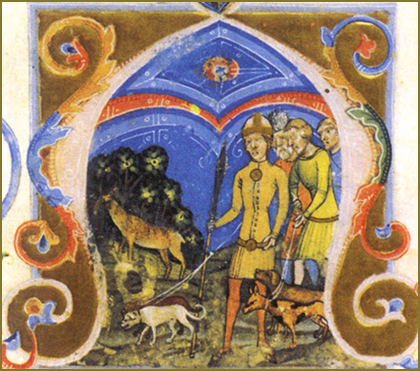 Vizsla and Agár-like dogs, and an extinct dog, the Szelindek were represented in King Anjou House Nagy Lajos’ Illuminated Chronicle, also known as Chronica Hungarorum. Published in 1358, it shows how important these dogs were to the everyday life of the Hungarian aristocrat. The second folio depicts an Agár in the front and the extinct Szelindek-like dog behind it. The third folio depicts the letter "A" embellished with a hunting scene with four dogs. The front dog resembles a Vizsla and the dog on the left matches the ancient Agár. The 53rd folio depicts the letter "D" decorated with another hunting scene with a dog resembling a running Vizsla. This collection of the Lives of Saints was specifically written for Prince András, son of King Károly Róbert I (1301–1342) in 1330. The fourth story tells St. Peter's life in 22 pictures. The 16th image depicts two dogs in the front. The left dog strongly resembles the Vizsla, as we know it today. 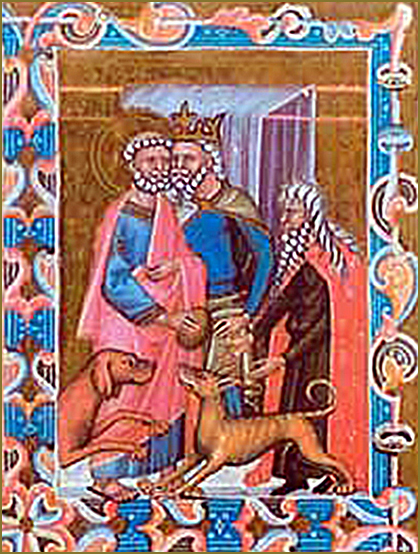 Martinus Opifex, King Zsigmond’s painter-in-court, illuminated the early 15th-century manuscript with common, everyday scenes. 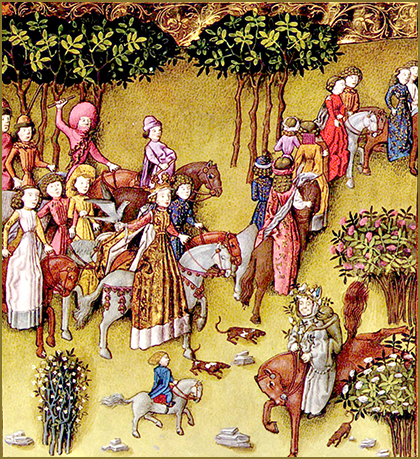 In one scene, he depicts a royal procession that includes children with Agár-looking dogs. Codices of Dominicus Kálmáncsehi (from 1481) has this beautiful hunting scene on the bottom of its 308th folio. The decoration depicts two huntsmen with three Szelindek-like dogs attacking a wild boar. Their robust, short-haired bodies are all in motion. Historians argue whether the elaborate, lusciously illuminated scene depicts Vizsla, Kuvasz or Szelindek. The Vizsla appears in a 1487 royal missal belonging to King Mátyás I. The illuminated letter "E" on 107th folio depicts a Vizsla lying calm in the middle of the throne room while King David prays to the Lord. 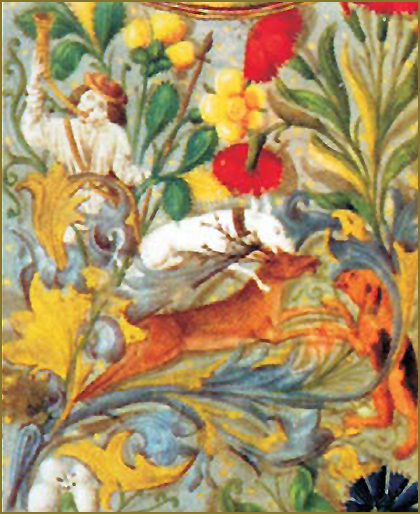 The third folio depicts a luscious hunting scene in a paradise-like heavenly garden. The page decoration also portrays an Agár-like dog. 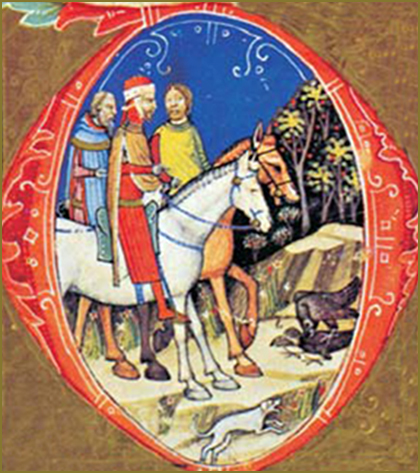 The The Ransanus Chronicle was written for Mátyás I around 1489. 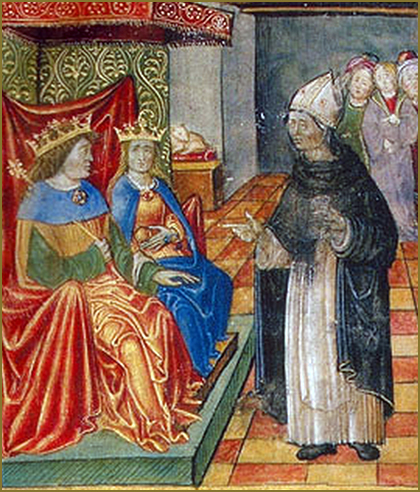 The 16th folio depicts the royal couple listening to Bishop Ransanus. A small, unidentifiable white dog comfortably lying on its velvet throne is also listening from the far left corner of the royal room. Multiple authors around the 16th century created this prayer book. 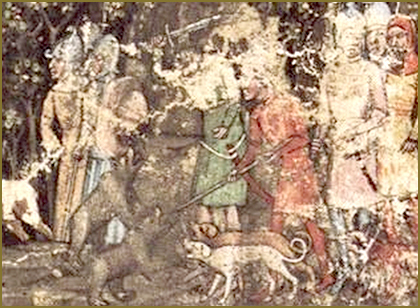 The Punishment of the Hunter scene depicts rabbits as heroes and three Vizslas as villains waiting for their deaths, while a tied-up Agár is waiting for its end.